Features. 36 in. 91 cm Heavy Duty Hedge Shears.. Includes deep sap groove hard chromed high carbon steel straight blades.. Serrated at base of blade.. Extra-long extruded aircraft aluminum handles with non-slip cushioned TPR grips offer a longer reach.. Center oiler bolt makes maintenance easier.. Designed for all-day use by landscape professionals.. Bring Professional Quality and Performance Home.. 36 in. professional heavy duty hedge shears. Hard chrome step-down blades with serrated base. Long extruded aircraft aluminum handles with TPR grips. Innovative self-oiling center bolt.. 11.25 in. blade length with deep sap groove.. Hand tools from Barnel USA feature high quality construction with unmatched lasting performance that will be appreciated by landscapehorticulture professionals and garden enthusiasts alike.. Dimension - 36 x 2 x 14 in.. Item weight - 3.75 lbs. 36 in. 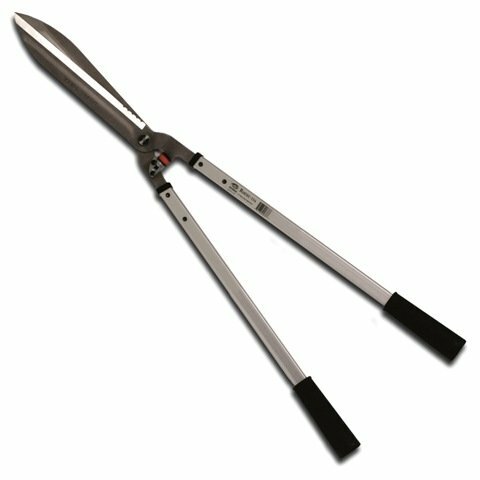 (91 cm) Heavy Duty Hedge Shears. Includes deep sap groove, hard chromed high carbon steel straight blades. Extra-long extruded aircraft aluminum handles with non-slip cushioned TPR grips offer a longer reach. Center oiler bolt makes maintenance easier. If you have any questions about this product by Barnel, contact us by completing and submitting the form below. If you are looking for a specif part number, please include it with your message.